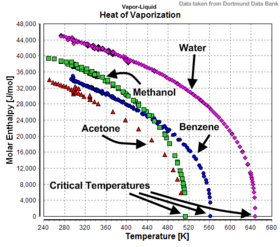 Temperatur-dependency o the heats o vapourisation for watter, methanol, benzene, an acetone. The enthalpy o vapourisation, (seembol ∆Hvap) an aa kent as the (latent) heat o vapourisation or heat o evaporation, is the amoont o energy (enthalpy) that maun be addit tae the liquid substance, tae transform a quantity o that substance intae a gas. This page wis last eeditit on 28 August 2017, at 02:24.